red, originally uploaded by jahansell. It's July, it's high summer, and the Theme Day is RED. Every color looks brighter, more saturated, at this time of year, especially just before sunset. 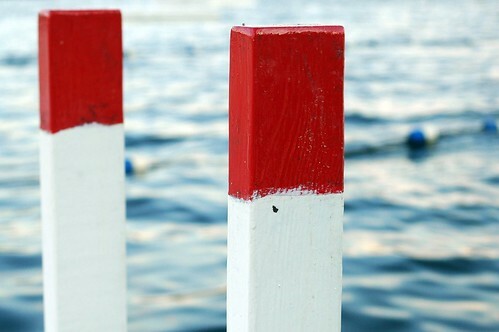 This photo is of the ladders on the dock at the beach, Mudge Pond. well it is about an hour and a half off July here as I view my 9th themed post of posts -- are they posts? Nice minimalist composition. I agree about the light at this time of year making everything brighter. It isn't quite July for you yet (and nor for me in Switzerland), so I was a bit curious when I saw the photo on the portal. Haha... It's a post on posts! I love the simplicity of your photo-very nicely done! Less is more that for sure for your picture. Excellent choice of picture. Jenny, this is a fabulous photo. I love it. And Igor, who's sitting next to me, concurs! It is difficult when posting to remember that for some today can be yesterday or tomorrow! Love this shot! very simple and so effective. Nice picture of something so common. Ladders. I like the idea for theme day. Good frame. DOF and texture! you're right Jenny, all the colours are more saturated at this time of the year. isn't this a great choice of red colour for the theme day, even the most simplest things look more alive and great. have a lovely red sunday! A good post for this post!! Simple and so graphic. I can recognize your eye, Jenny. Red, white, in blue water. Very 4th of July-ish. love it! simple and very nice. Two very different reds today and yesterday, well done! I'm typing this on July 2. As I'm trying to visit all 100 sites.